The Garden – Jardín Botánico de Cartagena "Guillermo Piñeres"
The wife of the late Guillermo Piñeres inherited the Matute Estate and decided as an idea from President José Vicente to create a garden in the area surrounding the church. Hence the Botanical Garden of Cartagena “Guillermo Piñeres” was founded in 1974 and was opened to the public in 1978. Native and exotic plants were planted in the arboretum and palmetum, and a fern garden and orchidarium were established. Unfortunately, the orchidarium was destroyed after a storm by a tree fall. The ruins of an old primary school also lie on the premises. In 2016 a new nursery was completed where seeds are germinated in large scale for reforestation project and exotic plants are grown for future addition to the living collection in the garden. Currently garden maintenance is carried out by Comfenalco, who uses the grounds for recreation activities. Our mission is to educate, investigate and preserve the Colombian Caribbean flora and fauna. We aim to provide botanically and responsibly sourced material for reintroduction and reforestation, to educate the people about the diversity and peculiarity of the Caribbean dry forests. We also host graduate students to do projects on the local flora and fauna, and we maintain a reference collection of herbarium specimens and an extensive library on Neotropical flora. The garden is situated around at 10.354644 North latitude and 75.429485 West longitude, in the hills above Cartagena in the satellite town of Turbaco. It occupies a total of 9 hectares, which is divided into 5 ha of planted collections and 4 ha of natural forest. It lies around 100 meters above sea level and has an average annual rainfall of 232 mm. Rain falls mostly from late August to early December, with a shorter rainy season in April. The rest of the year it enjoys a dry sunny climate with high average temperatures, although mist and a frequent breeze from the hills make it a pleasant climate. Despite the long dry season, the natural spring supplies the garden with ample fresh water throughout the year. Some of the paths are rather steep, so be sure to wear good, comfortable shoes on your visit. It is a wonderful place to contemplate, relax and to get into close contact with the natural wonders of the Colombian Caribbean. The natural flora of the Botanical Garden is diverse and well represented both in the natural forest and in the planted collections. 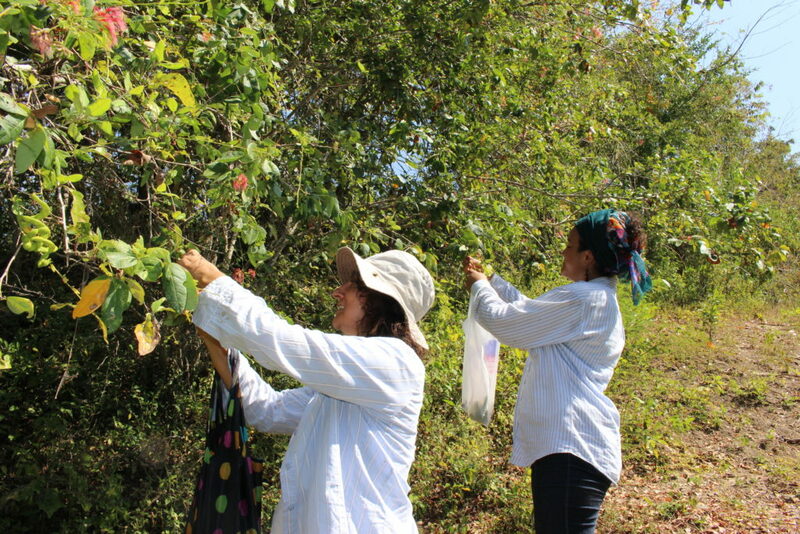 It is one of the most important collections of plants from the Caribbean and because the dry Caribbean forests are highly threatened it makes this garden even of greater importance for conservation and as a seed source for reintroduction programs. The garden has many well-developed specimens of trees, shrubs and herbs. There are some incredibly large specimens of giant cashew (Anacardium excelsum), and white fig (Ficus maxima), which rise above the forest canopy with their massive crowns and huge trunks supported by large buttress roots. One giant cashew is a focal point in the garden and may be over 500 years old. Other frequent trees in the garden are Aspidosperma desmanthum, Astrocaryum malybo, Attalea butyracea, Bursera simaruba, Cavanillesia platanifolia, Cecropia peltata, Cedrela odorata, Ficus citrifolia, Mammea americana, Nectandra turbacensis, Pachyra aquatica, Pseudobombax septenatum, Sterculia apetala and Swietenia macrophylla. Many of these species have valuable wood and are thus highly threatened in their remaining populations outside the garden. 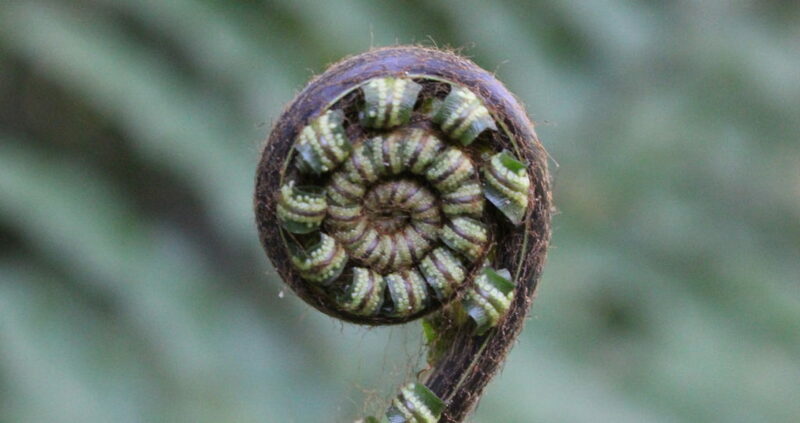 You can see more information on the flora and a checklist of the species in the garden here. The Garden and surrounding area are one the few natural refuges in the region and hence it houses many animals that have been lost in areas that have seen more urban development. The area of Turbaco has always been famed for its bird diversity and thus is an ideal place for bird watchers. An experienced bird spotter can easily see or hear some 45 species of birds, including unusual ones like manakins, motmots, stripe-backed wrens, and the endemic chestnut-winged chachalaca, but the garden is also home to many other animals. The botanical garden is home to a many mammals, reptiles, birds, amphibians, fish and invertebrates. More information about the animals in the garden can be read here. The Botanical Garden has several specialist collections that are currently being developed. Arboretum: This is a collection of over 100 native and exotic tree species, some threatened and many of economic interest. We are currently building capacity to have an ex-situ collection of trees native to the Caribbean region of Colombia. Orchard: A small area is designated to show unusual fruiting trees of the Caribbean and beyond. Palmetum: Our palm collection houses a selection of Caribbean and exotic palm trees. 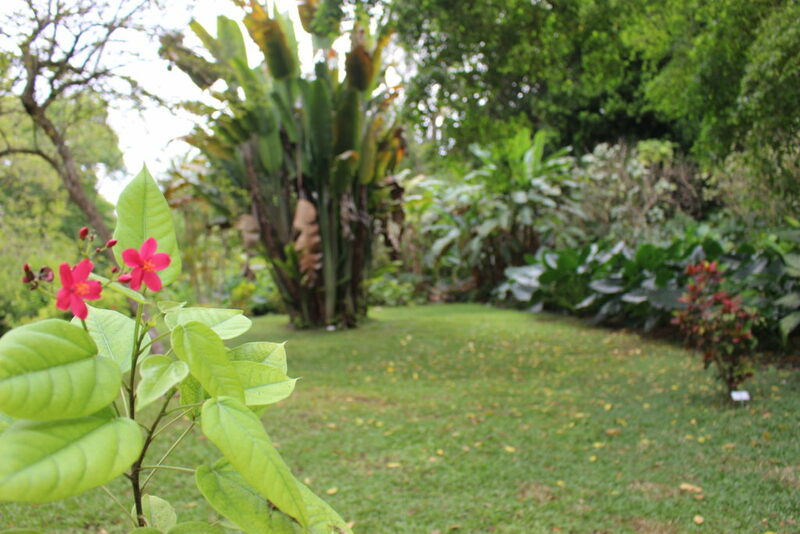 Drug and Fragrance Garden: We have a small collection of perfumed, medicinal and psychoactive plants. Xerophytic Garden: This is a selection of cacti and succulents from the Americas, Africa, Asia and Madagascar. The collection is currently under development. It shows how a garden can be created with limited water resources. developing our evolutionary garden collection, which will display lycopods, ferns, conifers and early dicots (Magnoliads, Pipevines, etc.). The aim is to show how plants evolved from small moss-like plants spread by spores, to wind-pollinated cone-bearing plants and finally flowering plants pollinated and distributed by animals. We have recently undertaken an expedition to Santa Marta to collect ferns and gymnosperms for this garden. Ornamental Garden: Beautiful meadows surrounded by ornamental borders connect the scientific collections. There are many unusual ornamental plants, some of which were obtained through exchange with other botanical gardens. The ornamental garden includes a nice collection of Zingiberales, the bananas, gingers and relatives. Native forest: Four hectares of primary dry forest have been preserved in the garden, including some very large trees and a diverse flora and fauna. 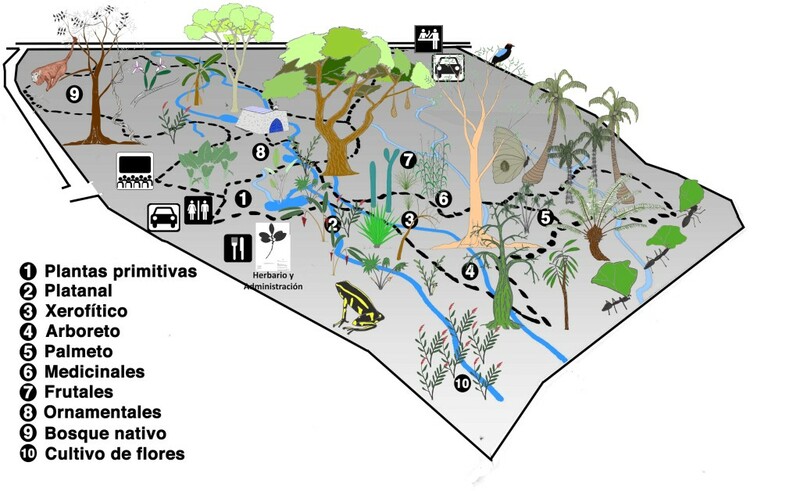 Primary forest is highly threatened in Caribbean Colombia, and thus this makes it an important refuge.